My daughter’s new princess themed bedroom is done and I’ve slowly been sharing all the fun changes I made to the room. My goal was to avoid purchasing anything new for the room. I made so many fun changes with supplies we already had at home. My childhood dresser moved to college with me and many years later was refinished and painted purple for my daughter’s nursery. 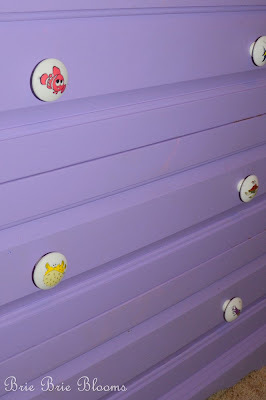 The nursery was jungle themed and at the time I had purple hippo drawer pulls on the dresser. 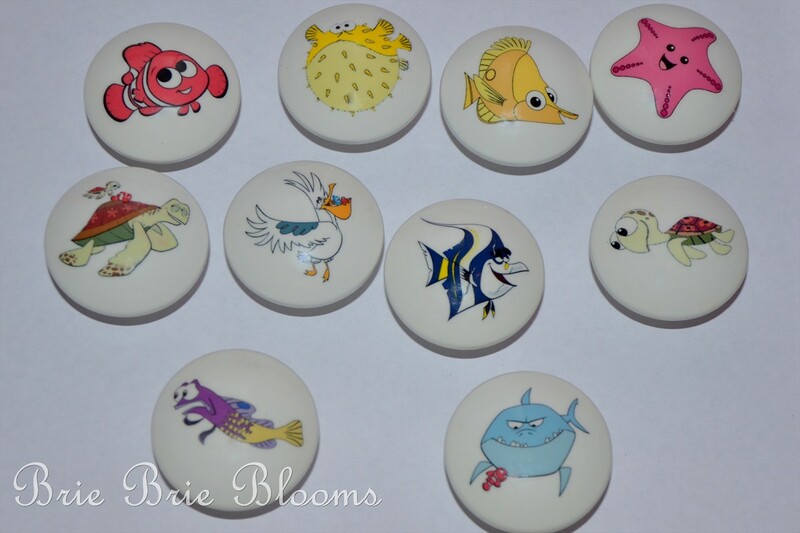 The room transitioned into a big girl Nemo themed room and I changed the drawer pulls again. For the new princess room, I used the existing drawer pulls and updated them using princess tattoos. 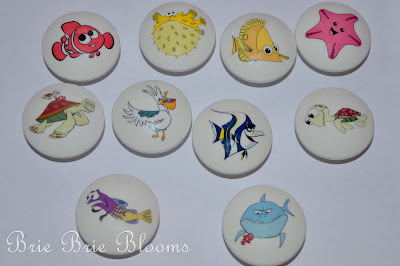 The Nemo drawer pulls were very cute but quite pricey for the entire set online. I used a piece of sand paper and gently rubbed off the top clear coat and the Nemo design from each pull. 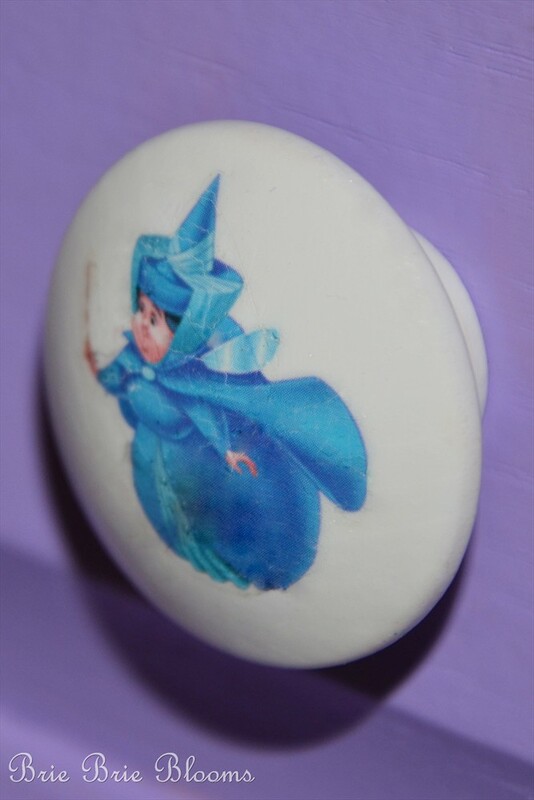 Then I found my daughter’s stash of princess tattoos and, with the same technique used when applying them on children, put them on the blank tops of the drawer pulls. 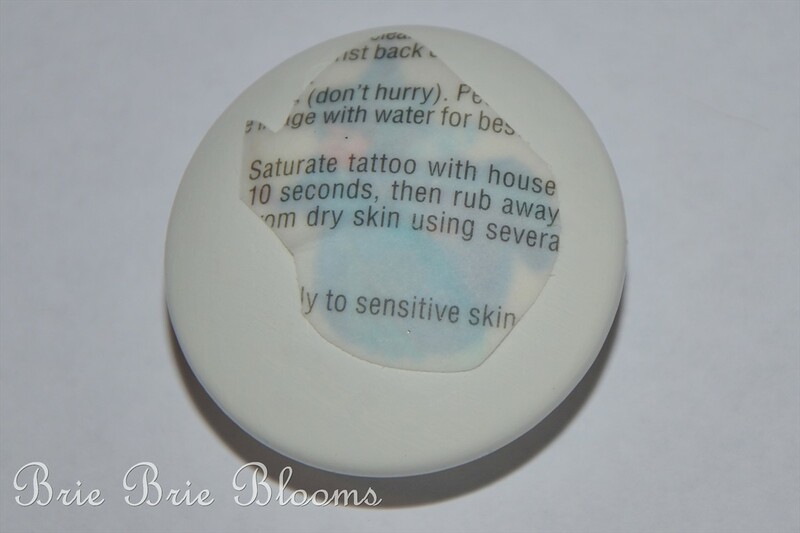 I applied a layer of Mod Podge to the tops of the pulls just to be sure the tattoos could not be easily removed by my curious three year old daughter. This was such an easy project and completely changed the look of the dresser! I’ll probably be doing this every time my daughter wants a new character in her bedroom! Oh such a cute idea! Great job. This is so cute. I love the knobs. I have a link party on Wednesdays, and I would love it if you would link this and any other posts. It is called Wednesdays Adorned From Above Link Party. It runs from Wednesday to Sundays.